We were exclusively appointed by North West based Steadplan as they required the development of an extensive new corporate website that they could operate to showcase their professional services and affiliated business connections. From the writing of content copy, to the customised development of their content management system, Team Creative worked tirelessly (no pun intended) to deliver a wonderfully creative site that will stand the test of time due to the flexible programming language used. 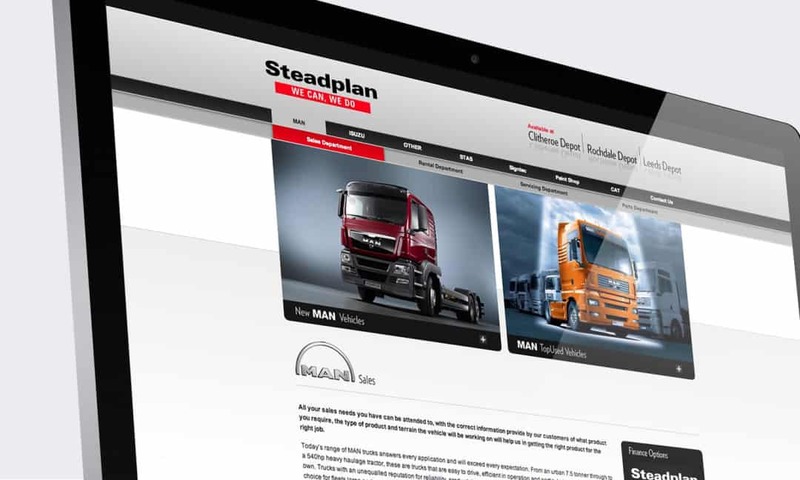 In addition, Steadplan can also provide updates to the transport world through their News page and promote used vehicles, trailers and parts for sale… in an instant! Steadplan offer a ‘One Stop Shop’, everything that hard pressed transport businesses need whether a small business through to major UK & International fleets, whilst providing Top class customer service and support, maintaining and repairing Trucks, Trailers & Plant that perform. The bespoke website created by our digital team was designed, developed and built to a strict deadline and was ready for Steadplan’s desired launch date which tied in with one of their key international events.